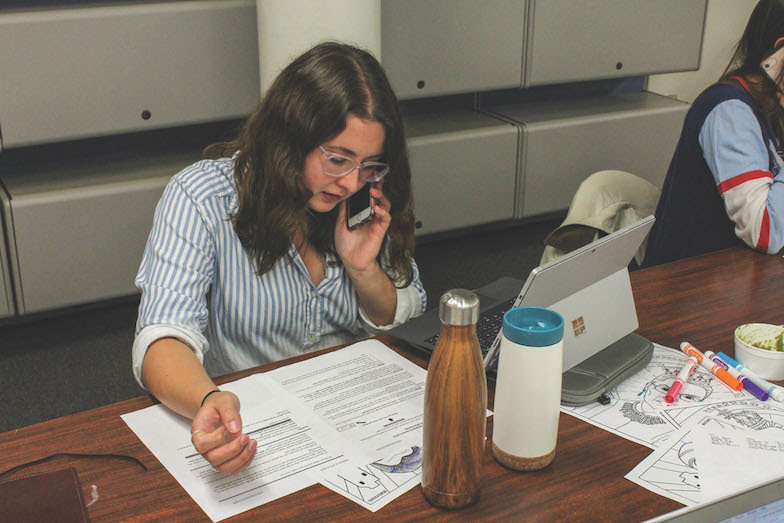 On Tuesday, Sept. 11, the University of Maine’s Feminist Collective, in collaboration with Planned Parenthood, held the Planned Parenthood Maine Action Phone Bank in the Wade Center, on the first floor of the Memorial Union. The intention of this event was to allow students to engage with their representatives and ask them to oppose Brett Kavanaugh’s nomination for Supreme Court. The main focus of this event was to get Maine residents to call Sen. Susan Collins’ office and ask her to oppose the nomination, as she is a swing vote. The phone bank was a casual event with eight people crowded around a conference table. During the course of the night, they called people whose numbers were in the Planned Parenthood phone bank. There was a script for the participants so that they knew what to tell each person on the other side of the line. This script included who they were, why they were calling, and how to contact Collins if they were interested. Meghan Frisard, a co-chair of UMaine’s Feminist Collective, believes that Kavanaugh’s nomination threatens reproductive rights. “There are all kinds of literature about how Kavanaugh doesn’t support Roe versus Wade.” Frisard said. If you’re looking to get involved with this event, it will be held in the Wade Center every Monday night from 5-8 p.m. until the end of Kavanaugh’s confirmation hearing.